Breakfast Courier employee Keith Kozliwski delivers to a Mount Pleasant customer. Competition in Vancouver’s restaurant industry is always fierce. Now that more consumers want food delivered on-demand, restaurateurs are turning to couriers for dinner drop-offs. Daily Delivery started its operation nearly five years ago and employs more than 50 bike couriers in its delivery fleet. Founder Salar Rismani said the competition between food-delivery companies is a good thing and that means jobs for couriers. The job itself is straightforward. Couriers ride their bicycles to restaurants, pick up food and deliver it to customers’ doors. The service allows customers to stay home and it allows restaurants to provide delivery service without employing its own drivers. According to Rismani, foodora’s arrival in Vancouver in November 2016 brought on a spike in people seeking work as bike couriers. Deliveries used to be the domain of mopeds and cars, but now bikes are beginning to close in on the delivery scene. Foodora chose bicycles as an alternative due to Vancouver’s dense traffic. Cyclists can often move through the city more efficiently than drivers. Couriers are linked to their employers through mobile apps and can accept or deny depending on if they need the money, are in the area or have the time. 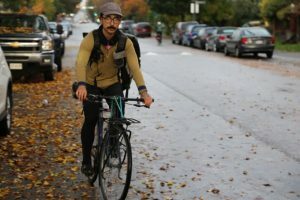 Kiyoshi Kadota is one of Vancouver’s many bike couriers. He works 40-hour weeks at a courier company that delivers papers and more traditional courier fare. The firm guarantees Kadota a base wage, but he wanted some extra income for travel. Kadota took up a food-courier job with foodora, which he does part-time outside of his regular schedule with the paper courier company. He says it’s a job anyone can do. As well, with restaurants competing fiercely, the demand for couriers is large, resulting in quick hiring. Couriers find the restaurant delivery an easy fit with other jobs as the hours tend to be evenings and weekends, rather than banker’s hours like most couriers work. “There is very little competition within food-delivery courier communities,” said Kadota, who was invited to foodora orientation a week after applying. He also mentioned knowing other couriers who began working only a day after applying for DoorDash. Kiyoshi Kadota is on his bike all day, either delivering documents for a courier company or meals for foodora. Foodora, which currently has around 150 active bike couriers in Vancouver, offers couriers $4.50 per delivery, plus $1 per kilometre travelled and tips. 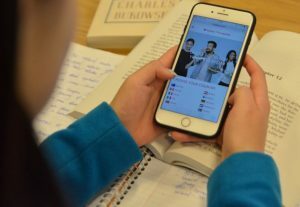 Doordash pays $8 per delivery plus tips. 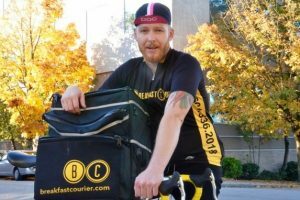 Bike couriers can either operate as independent contractors or work for companies that serve restaurants directly, averaging earnings of around $20 per hour. Rismani said that having competing food-delivery services in Vancouver is a good thing for both Daily Delivery and cyclists looking to make some extra money or make a living while being active. The courier circuit offers flexibility, exercise and outdoor work. But that seems to appeal to only certain people. Foodora and other food-delivery service apps are most often accessed through mobile devices. While it would like to see more women apply, Daily Delivery has not yet tried to specifically recruit women. As delivery services corner the food-delivery market, both career couriers like Kadota and casual couriers can expect abundant delivery opportunities.